These bottle cap rings can be used to accessories a punk, steam punk, or post-apocalyptic themed costume. They can also be worn to add a unique look to your everyday outfit. 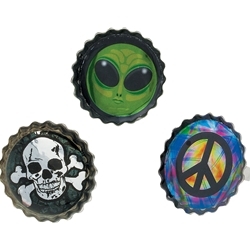 The bottle cap rings are made of metal and feature an assorted design painted onto each ring. Price is for one ring.